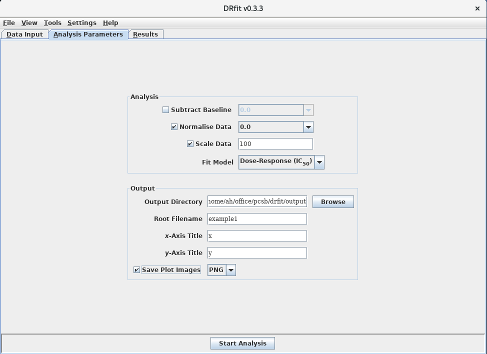 DRfit is a Java tool for analysis of multiple data sets comprising replicates of discrete bivariate data. In particular, the software has been designed to allow convenient analysis of data structures obtained from multi-well plate assays. 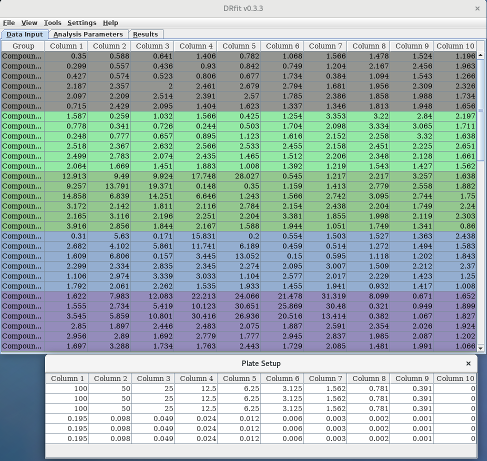 The organisation of data points on the multi-well plate as well as their values in individual data sets can be entered by the user into a built-in spreadsheet or loaded directly from a spreadsheet in Microsoft Excel format. The analysis pipeline can be configured to subtract background, normalise and scale data. 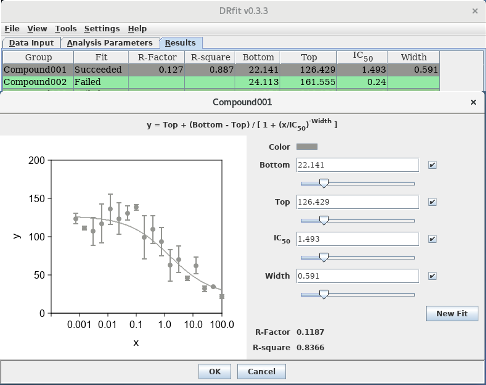 Outliers within sets of replicate data points can be identified automatically using a Grubbs test but also marked up manually by the user. For each data set, the software identifies the replicate data points from the defined matrix (plate) layout and calculates their means and standard errors. The averaged values are then automatically fitted using either a linear or a logistic dose response function. All fits can be visualised and interactively amended by the user. Data plots with fits can be written automatically for each data set and all results from the data analysis can be written into an Excel-formatted spreadsheet. The GUI is available in English, French and German. Download DRfit from the PCSB home page. Hofmann, A., Wlodawer, A. (2002) PCSB - a programme collection for structural biology and biophysical chemistry. Bioinformatics 18, 209-210.